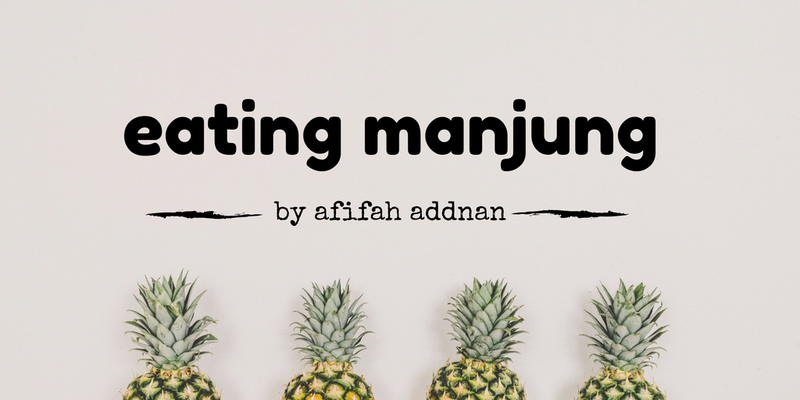 My second posts on this Let's Eat Manjung series. Btw, have you check out my brand new pages? I just made it. Today is a very productive day (eheh). There is this small garden built here and totally kinda out of place. It's too small to be made as jogging area and too open to be made as somewhere to hang out. There wasn't any soul ca be found there for the numerous time I've passed it (it really just beside the main road). Until Lemboy Restaurant was open there and every night, consistently, the place was filled with people. 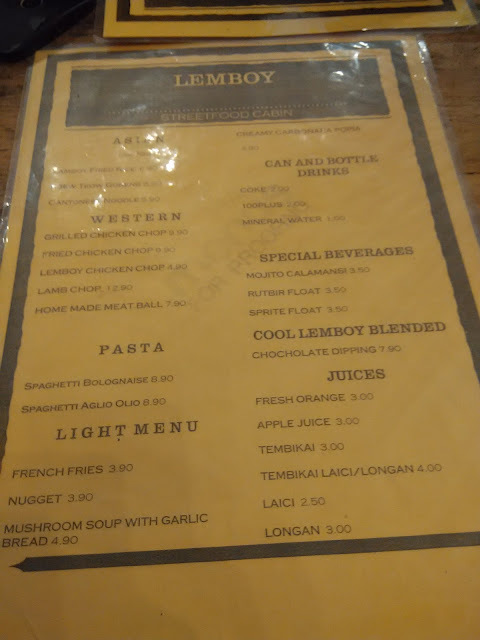 At least the part where Lemboy is lah. Basic western food menus were there and just look at the price. IT IS SO SO SO CHEAP! You can't see some of the prices and I'm sorryyyyyy. 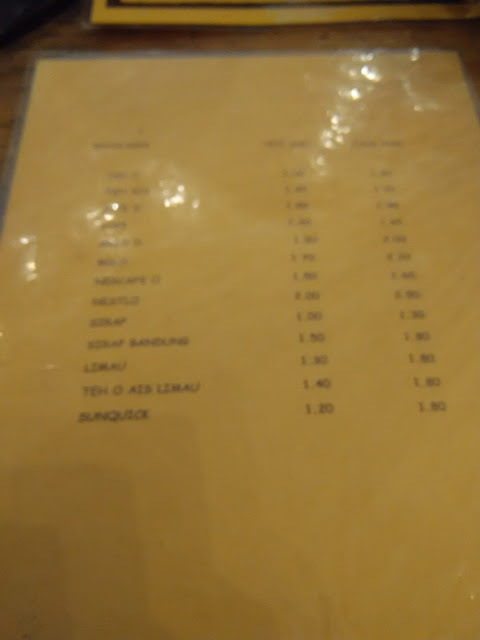 The prices for the drink were like regular kedai mamak. 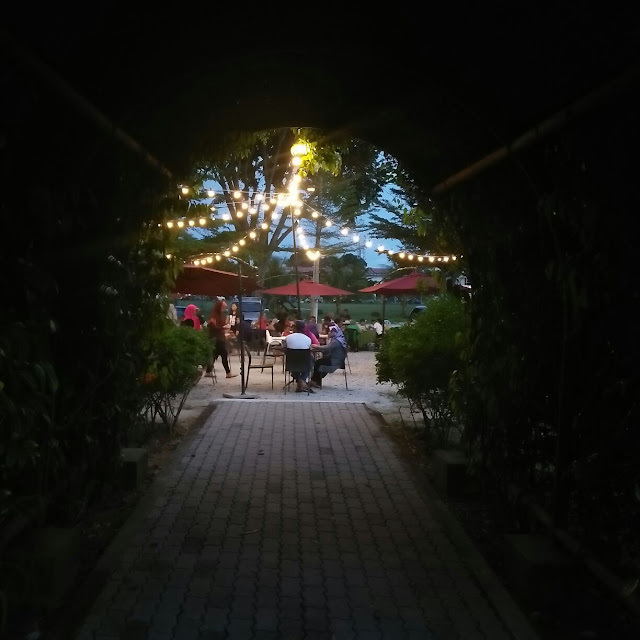 The lights were beautiful, isn't it? 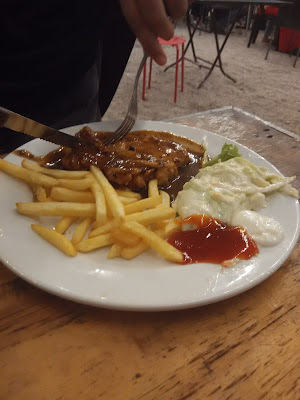 The RM4.90 chicken chop and we all have rootbeer float. Sadly, they were out of cantonese noodle so everyone was having the grilled chicken chop except for me. 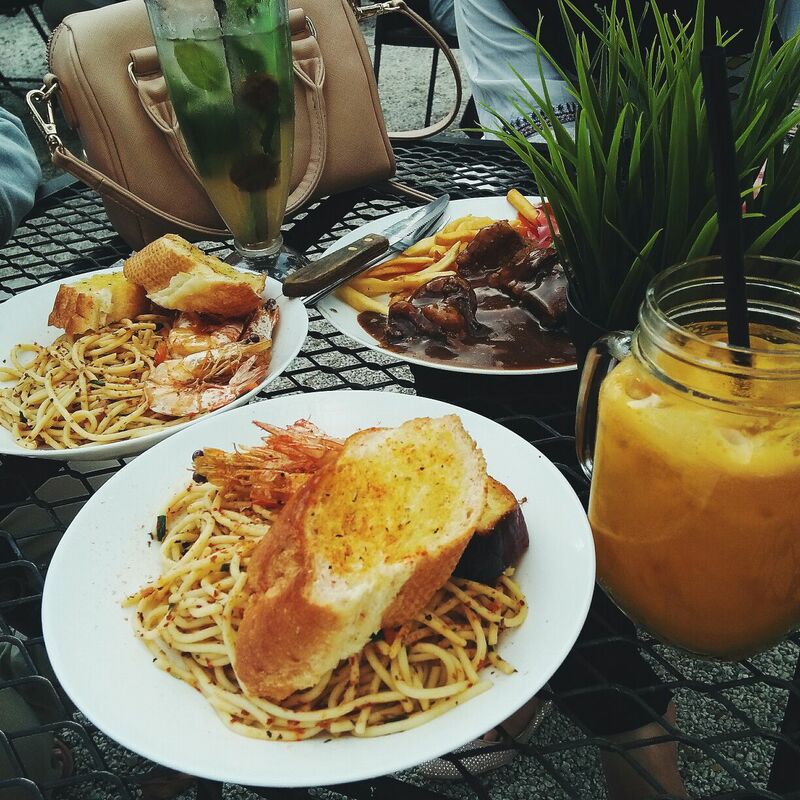 I have the spaghetti Aglio olio. The place was packed and the waiter has warned me it would take some time. That is why there is no spaghetti Aglio olio picture because it took so long that everyone has almost finished their food. I just dig in when it finally comes. I'm not sure if they were understaffed or if their kitchen couldn't cater the demands since it was only a container okayy. takpe dik, akak paham. Oh ya, my sister do tell me that her teachers said the workers in Lemboy were students from our highschool. True though, the peoples who worked there looked young. I saw a glimpse into their kitchen and I saw only teens. Quite sure most of them were younger than me. Earlier in their business, they have this nice chairs and tables and I guess since the peoples coming in were just a lot, they put those plastic chair and tables as well. I guess, even if the food are late, at least we were seated right. Enough that, let's talk about the food. It is delicious. If not because of the high traffic it gets, I'd go there religiously. I like how simple yet tasteful my spaghetti is and the black pepper sauce on the juicy chicken was also nice. My friend told me that she have tried their fried rice and also say that it is delicious. They can actually charged us more as according to current prices to these kinds of foods. Btw, I have learned my mistakes, I'll make sure to took better pictures next time. I got two more pictures from my sister! RM4.90 for chicken chop? 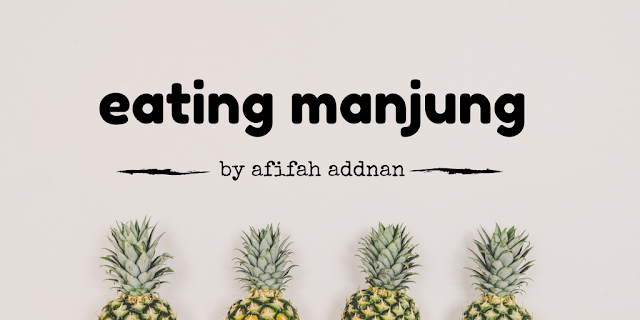 Memang berbaloilah singgah makan kat sini. Waaaaa, Lemboy Chicken Chop for RM4.90 is considered cheap! I hope it tasted nice for that price. Congrats for having a productive day! haha. Walid would disagree that hours on laptop would be considered productive though. LOL. It is too cheap exactly. The cheapest I found here is RM10. Now I don't think anyone would beat Lemboy and it tasted better than some the RM10 ones. I know right. I'm having hard time trusting my friend when she told me this but it is so true. Best memang but sekali sekala bolehla. Carik nasik je I ni sebenarnya. 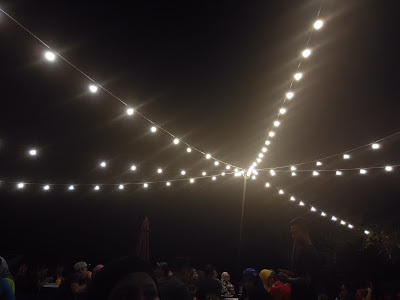 Ambil gambar next time makan kat sini eh. Biasanya kita gegurl suka ambik gambar. Hihi. Ada dapat some decent pictures from my sister but tak da masa nak upload lagi. Stay tuned? seyes sangat tak rugi to just try. pegi la pegi laaaaaaaaaaaa. Serius sangat, sila order dua teros. Roll On: January and February All Wrapped Up.